4.Signal generator provides a variety of choice: half sine wave, trapezoidal wave, sawtooth wave, square wave, etc. Warranty: one year free warranty for whole set machine,lifelong time maintainance. After-sale service: feedback within 2 hours after get the call. Service:OEM service,Design service,Buyer lable service. 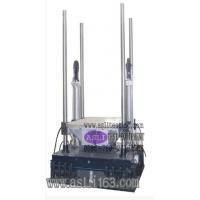 Acceleration Mechanical Shock Tester is mainly used for small products for impact test, to assess the product’s ability to withstand shock damage. It is often used in electronic components, electronic circuit boards and other environmental testing.